We offer a comprehensive conservatory cleaning service in Fife. Cleaning conservatory roofs, windows and uPVC framework including fascias and soffits to ensure your conservatory is returned to its original condition. Do you have a polycarbonate conservatory roof that is affected by algae, moss and other biological stains? Fife Window Cleaning Services have the answer! We can clean your conservatory roof and then treat it with a specialist biocidal wash that has an ongoing cleansing action combined with long term protection against the regrowth of ALL biological spores for the next 12 months. Our conservatory cleaning services are available in Dunfermline,Kirkcaldy,Glenrothes and all surrounding areas. A conservatory is a fantastic addition to your home, that can be cleaned with specialist chemicals and forms of treatment that will prolong its life and general upkeep. Generally, this will be done with a combination of hot water, non-harmful chemicals, magic sponges and window cleaning supplies. The waterfed-pole system we have offers the ability to reach the highest points of such conservatories for reachable cleaning of the centre sections. 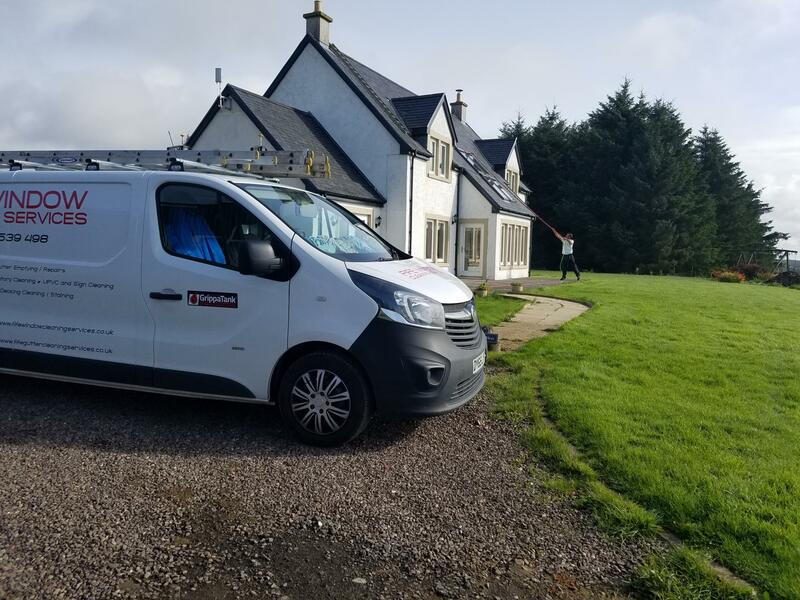 This avoids us having to put any pressure on the actual roof, and therefore offering the safest option to cleaning your conservatory in Fife. However, left unmaintained for too long algae can build up within the structure of the conservatory. If algae is left untreated then this can lead to condensation and faulty seals; resulting in leaks and damage to joints in your conservatory. It is often the case that dehumidifiers are noticed within conservatories in an attempt to reduce an already damp environment. The rate at which algae forms will depend on your area and factors like overhanging trees and location to other greenery. If you have trees nearby or overhanging the conservatory’ it is likely the algae will build up much quicker, and you may have noticed particular sides of the conservatory have more growth than others. We recommend a regular conservatory clean to ensure algae and debris build up is limited, along with keeping your property looking pristine. A basic conservatory clean is usually offered within each window clean of the property, although we offer specialist conservatory deep cleaning in Fife as well. This differs from a maintenance clean, due to much finer details being cleaned, such as the roof, side panels are individually scrubbed, and scuff marks are removed from surfaces. This more tailored clean is something a lot of customers choose to have done once a year and it is often maintained throughout the year. Our other exterior cleaning services in Fife include driveway and patio cleaning , pressure cleaning , gutters , fascias , soffits and cladding and decking cleaning. Call now or email using our online contact form.